Hill House with Five Bedrooms and Six and One-Half Baths. This classic fieldstone and log mountain residence, with 4,600 sq. ft. interior and 2,700 sq. ft. of porches and decks, has 5 bedrooms, 6 ½ baths and features two wood-burning stone fireplaces. 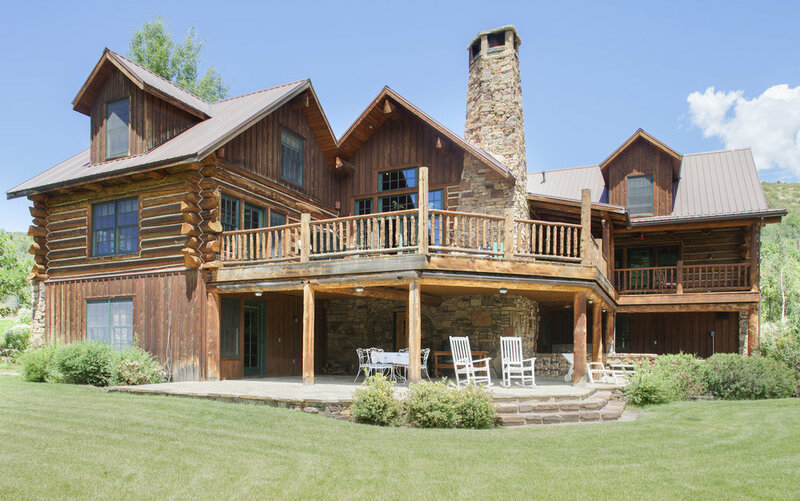 This mountain home is situated on 35 acres, just inside the Gunnison National Forest, adjacent to the historic Smith Fork Ranch. Breathtaking views in every direction. Surrounded on the north and south by 10,000 – 11,000 ft mountains; to the east, up the Smith Fork River Valley are the 12,000 ft peaks of the West Elk Wilderness, the least used wilderness area in the state. To the west is the historic Needle Rock, a 900 ft. outcropping that towers over the fertile North Fork Valley, home to Colorado’s best vineyards, wineries, orchards, organic farms & ranches. The Smith Fork of the Gunnison River, that runs through the property below Saddle Mountain, is a habitat for Rainbow, Brown and Brook Trout. The river runs through the south side of the Hill House property for approximately 250 yards and on through the length of the Smith Fork Ranch property for another 2 ½ miles. A pristine natural wetlands/marsh is also part of the Hill House property (and can be seen from the deck of the house), providing an intimate sanctuary for a variety of waterfowl, and other wildlife at different periods during the year. A hand-hewn applewood door opens into the great room. This is the center of the house, with large stone wood-burning fireplace, seating area and dining area. French doors open out to a large deck with stunning views east, south and west. Access to all areas of the house lead from different corners of the great room. Adjacent to the great room on the main floor is a large, fully equipped chef's kitchen, which features a Blue Star Professional Stove with 6 gas burners, stove top grill and two ovens; a Viking Professional Refrigerator; double drawer dishwashers, a warming drawer, wine cooler & large central food preparation area. The kitchen has a separate exit through a mud room (with separate laundry room) into a heated garage. A wide stair case from the great room leads down to the fieldstone room, a dining/entertainment center with a wood burning stone fireplace, pantry and wine cellar. There is a service area/pantry off the Fieldstone Room with dumbwaiter (from kitchen above) and counter tops for food service. 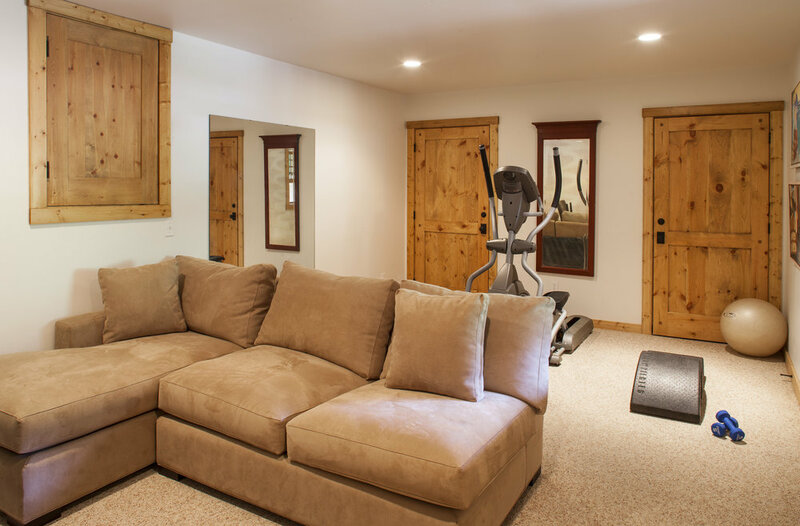 There is also a TV/fitness room and half bath adjacent to the Fieldstone Room. 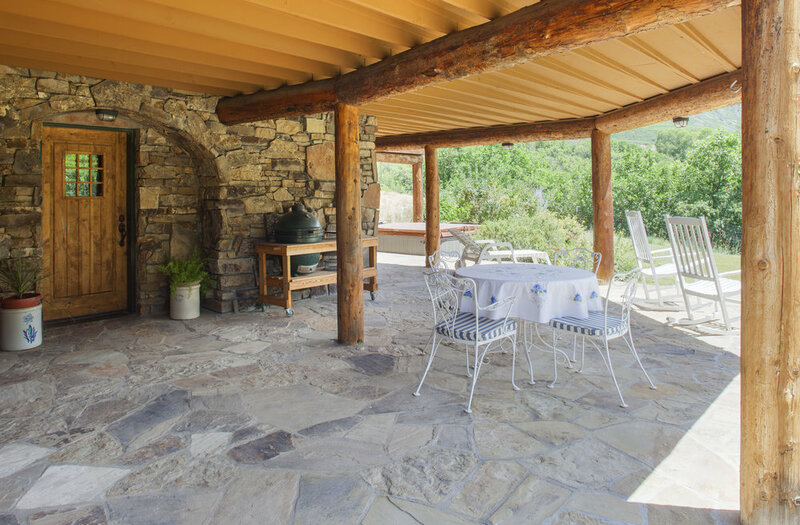 An exterior door opens from the Fieldstone Room to a large stone patio, hot tub, lower gardens and lawn. The master bedroom suite occupies the northeast corner of the house on the ground floor. It has a bedroom with king bed, his & her separate bathrooms and a large walk-in closet with two entrances. A door from the master suite opens out to a covered lounging porch with stunning views. Needle Rock Bedroom with Views Facing West. Stairs from the great room lead one flight up to the Needle Rock bedroom/sitting room facing west. There is a full bath with tub shower adjacent to the bedroom. In the hallway across from the bath is a large closet and second laundry room. A large library/gallery/painter's studio is down the hall, with large window and dramatic views east toward the mountains of the West Elk Wilderness. Saddle Mountain bedroom on ground floor, with tub/shower bath. This room has stunning views of The West Elks of the Rockies, Saddle Mountain & Needle rock. The room has a king bed(or 2 twins) and a private door to large deck facing south and east. The West Garden bedroom with queen bed is downstairs from the great room and has bathroom with shower. A door from the bedroom opens to a lovely private stone patio and rock garden. The top floor is the Southwest Lookout bedroom, currently outfitted with double bunk bed and twin trundle bed for children. 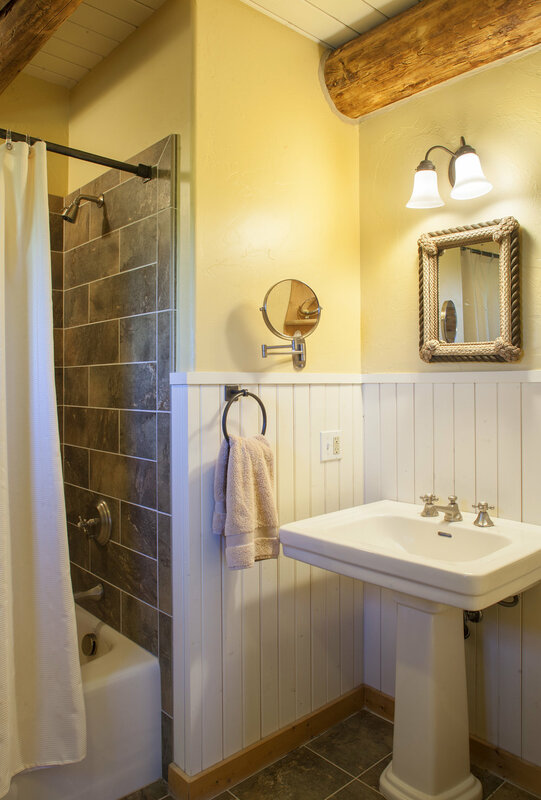 There is a small full bathroom with tub and shower. Windows open to spectacular view east, south and west. There is a one-car heated garage adjoining the kitchen. A door at the east end of the garage leads to a room that is currently the owners office, which is adjacent to the master suite. Adjacent to the heated garage is a two-car vehicle shelter which connects to another enclosed workshop/garage (that can accommodate a small sports car).